The Institute for Nature Study (附属自然教育園, Fuzoku Shizen Kyōiku-en) is a nature reserve in the heart of Tokyo near Meguro Station. The sights and sounds of the city are left behind when you enter the park. It is a wild, natural and quiet world even though the grounds are located near the Yamanote Line and bordered by part of the Tokyo Metropolitan Expressway. The Institute for Nature Study is operated by the National Museum of Nature and Science which also operates the National Science Museum at Ueno Park. The aim of the Institute is to preserve the natural environment of Tokyo's forests and marshlands. The grounds are used for research and education, although anyone may enjoy the park's trails and natural beauty. As with many parks and gardens throughout Tokyo, the Institute for Nature Study had its beginnings as a lord's residence some 500 years ago. The grounds became an Imperial estate from 1917 and since then the natural environment has been conserved. Now it belongs to the Ministry of Education who opened it to the public. The park can be reached in a ten minute walk from Meguro Station on the JR Yamanote Line, Nanboku Subway Line (Tokyo Metro) and Mita Subway Line (Toei). A stylish hotel offering single and dormitory-style rooms starting at 5,000 JPY. Seven minutes from Daikanyama station and ten minutes from Shibuya station on foot. One of the most popular hostels in Tokyo. 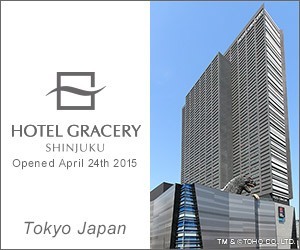 The most conveniently located hotel in Shinjuku, just a few steps from the station entrance. Adjacent to Tokyo Station, this is one of the city's most convenient and comfortable hotels. Just a few steps from Shinjuku Station, this hotel ranks among Tokyo's best values. One of Tokyo's most popular hotels and best values, a 5-10 minute walk from the station. Leading 5-star hotel on the top floors of Tokyo Midtown. Adjacent to Tokyo Station, this is the city's most conveniently located 5-star hotel. Tokyo Tours Various tours and travel packages for Tokyo and surroundings. Onsen day trip from Tokyo?